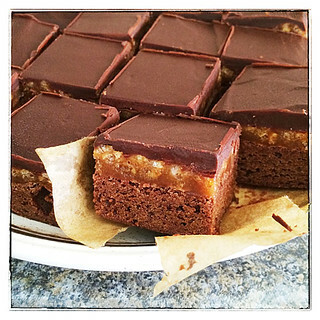 The jury is still out for us on these caramel crunch brownie bars from a Donna Hay recipe, but we did discover that if you heat them in the microwave for 20 seconds or so, they go all lovely and melty, perfect to eat with some vanilla ice cream. 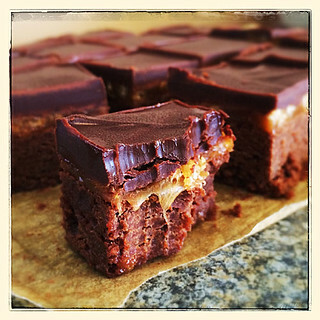 The original recipe makes an awful lot of caramel and ganache for the amount of brownie, so I cut the quantities down for these two elements, with a third less for the caramel and halving the ganache ingredients. I also used double cream for the ganache, as I prefer it. For Donna Hay's original quantities, click here. Preheat oven to 180°C (350°F). 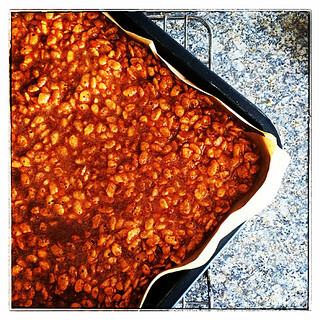 Lightly grease a 20cm-square cake tin and line with non-stick baking parchment. To make the brownie base, put the chocolate and butter into a small pan over a low heat and stir until melted and smooth, remove from the heat. Place the sugar, eggs, flour and cocoa in a bowl, along with the chocolate mixture and mix until thoroughly combined. Pour the mixture into the prepared tin and bake for 25-30 minutes or until set. Allow to cool in the tin. To make the caramel crunch, place the sugar and water in a small saucepan over low heat and gently swirl the pan every now and then until the sugar has dissolved. Turn the heat up to medium high and cook until the mixture is golden, about 8-10 minutes. Don't stir it during this time. It should reach 160ºC (325ºF) on a sugar thermometer. Add the cream and butter and stir until well combined. 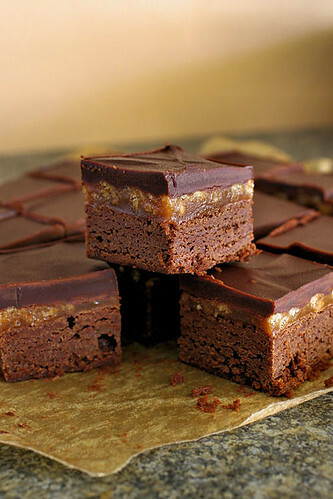 Stir in the rice cereal and pour the caramel mixture over the brownie, smoothing the top. Set aside for 30 minutes at room temperature or until almost set. To make the chocolate ganache, put the chocolate and cream in a saucepan over a low heat and stir until melted and smooth. Pour over the caramel and allow to cool at room temperature for 3 hours or until set. 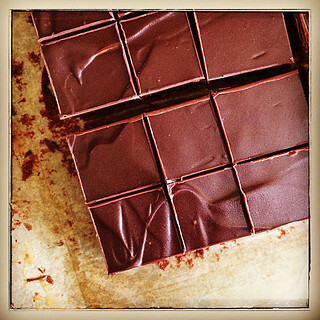 Slice into small squares or bars. This is best eaten within 2 days.